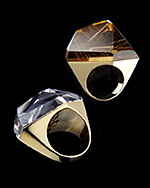 H. STERN creates inspired jewelry for over 60 years! She said that 95% of the H. STERN brand is focused on the woman, and is either self-purchased, selected by a woman, or by a man who comes to H. STERN based on the brand. 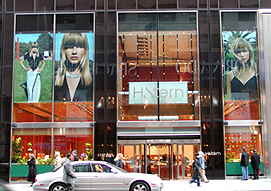 The privately held company founded by Hans Stern, and together with his sons, Roberto, who is breaking the mold with new creative designs in Brazil, and Ronaldo, who runs the New York store, H. STERN continues to enchant and delight with their creativity, dedication to excellence in service and their professionalism. When I met with Ms. Hansen she had just come from an exciting trip to visit the emerald mines in Brazil for H. STERN, where she descended 250 feet into the mines, which are like a cave. Inside, it must have looked like Aladdin’s Cave laden with jewels, which will find their way into a spectacular piece of H. STERN’s jewelry. 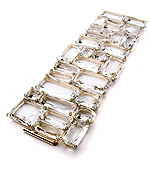 Fashion has had a positive effect on jewelry, and the name H. STERN is widely respected, where their jewelry is frequently worn by heads-of-state, as well as seen on the Red Carpets around the world where they have been worn by such celebrities as Lucy Liu, Eva Langoria, Teri Hatcher, Beyonce Knowles, Finola Hughes and Sandra Oh, to name just a few, and their custom designed pieces are frequently seen in films (including Austin Powers, Legally Blonde, Intolerable Cruelty). Whether you are a celebrity, or just want to feel like one, H. STERN creates pieces designed to thrill the jewelry lover in all of us. When I asked Ms. Hansen about her personable favorites, she told me that her favorite piece is their 10’ Fluid Gold necklace in matte 18K yellow gold, an extremely versatile piece that can be worn as a multi-strand necklace, or wrapped around your wrist or arm to create a large band of gold bracelet, which was how she was wearing hers. She also was wearing the Diane Von Furstenberg rutilated quartz shot with gold “power ring” that was designed with imperfections, to make it interesting. When I took a look at that ring, I felt like I was looking at the super-hero Wonder Woman’s ring. As for me, I love their Cobblestone designs, which were inspired by the cobblestone streets of Buzios in Brazil. The pieces are gorgeous crystals and diamonds set in polished 18K noble gold in varying sizes and shapes set in cobblestone patterns to create earrings, rings and bracelets. I also would love to own their 10’ Fluid Gold necklace, just in case “Santa” is listening. Then again, with 2 new collections per year, Santa can always find something for me there! H. STERN celebrates its 60th anniversary this year. Congratulations, to H. STERN on their achievement in innovation, style and creativity in the world of jewelry. Read more about New York in the Destinations, Hotels and Resorts, Restaurants, Chefs' Recipes, Gastronomy, Arts and Antiques, Music Scene, Luxury Products and Wine Cellar sections. © August 2005. Luxury Experience www.LuxuryExperience.com All rights reserved.